It has been busy at the club since the last Newsletter. The Trivia Night held on June 20th was attended by about 50 people who all had a fun evening. Then on June 21st, the Ladies Division hosted their annual Field Day with 92 participants. It was a nice sunny day but the high winds made for difficult conditions. The overall low gross winner was Joanie McCarville of Ashburn with a score of 83 and the low net of the field was won by Karen Paley, Northumberland, with a score of 69. The first 9 and Dine of the season was held on June 23 with a good turnout. 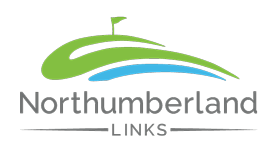 And, the Northumberland Classic was held this past weekend with 75 players. The overall winner was Stu Musgrave of Country Meadows, NB. We welcome new members: Neil Moffatt, Jeff Miles, Mike Dow, Lynne Crowell, Donna Beaton and Stephen MacQuarrie. The Club needs more members to buy a ticket and sell a ticket for our fundraising raffle for the Quebec Trip or $8,000. Now the money from every ticket sold is profit for the club. If ‘every member buys a ticket and sells a ticket’ there is the potential for the club to make $16,000 and the cost of the downstairs renovations will be covered. You don’t have to be a club member of a golfer to buy a ticket.